Don’t let the winter season be reason to ignore your grill! With these tips and suggestions, you’ll be well on your way to firing that grill right back up enjoying it year-round. Isn’t there just something about food that tastes better around your dining table when it was grilled? When you head outside to grill in the winter, first let me suggest that you are prepared with the proper attire! A hat, gloves and heavy coat will keep you warm, and be sure to leave them on when going in and out of the house with food. You don’t want to end up with the flu, even if grilling is a great reason! Stay away from scarves though to prevent the fabric from catching fire if you lean over the grill. Remove any and all snow and ice from on and around the grill. The grill will heat up faster and you’ll help to prevent a slip and fall. Inspect the grill to make sure all is working correctly. Take a look at the gas lines and make sure there are no blockages that will restrict the gas flow. Also check that the flame burns blue not yellow. A yellow flame indicates clogged air inlets or burners that need adjusting. Make sure the grill is placed at least 10 feet away from the exterior of your home and any trees or other plant life that could catch fire. Do not grill on an enclosed porch or garage. Always opt for a well-ventilated area. 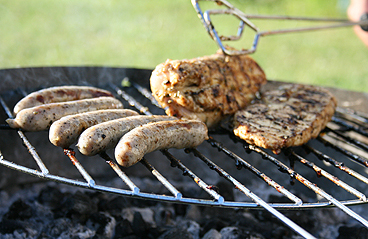 Start heating the grill earlier than you would during the summer, as it will take longer to heat up in the winter. Use a meat thermometer to make sure your food is cooked properly. Keep the grill lid closed to keep as much heat as possible inside. Whether you’re grilling in the winter or summer, you’ll want to consider the health factors. There are better ways than others to make sure you are providing the healthiest and safest grilled food, while making sure the taste is not left behind! Do you have other tips for grilling in the winter?